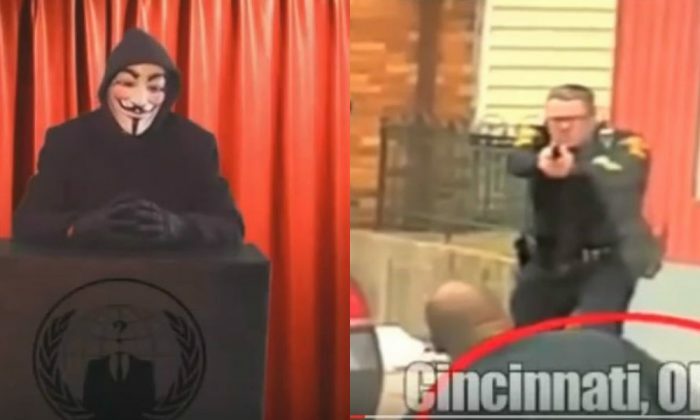 Hacker collective Anonymous claims it has released the personal information belonging to officers with the Cincinnati Police Department. In a video posted online, Anonymous said it released the personal information of 52 employees with the department, from Chief Eliot Isaac to ordinary police officers. It was uploaded on YouTube by user Anon Verdict, talking about “three separate cell phone clips” of police shooting a man who was allegedly holding up his hands. Cincinnati police Lt. Steve Saunders told Cincinnati.com that the department is investigating the situation to determine any risk to officers and establish if there has been a security breach. Anonymous claimed CPD officers shot and killed suspect Paul Gaston because he was black. “When their addresses are put out in the public, that’s a concern. I know that we have a section working on that to try to knock down whenever our addresses are put out in a public place like that and that’s what the police administration is doing about this,” Fraternal Order of Police president Sgt. Dan Hils told WLWT-TV. The “data dump,” as Anonymous put it, was uploaded on Pastebin.com before it was taken down. The group’s message served as a response to an officer-involved shooting in Westwood last week. Anonymous claimed CPD officers shot and killed suspect Paul Gaston because he was black, adding that officers didn’t use lethal force on a white suspect who was in a similar situation on the same day, FOX19 reported.